One of the fun things about living in my town is that I am just a five minute walk from Poland. My favourite shop to buy groceries in, if only because it's my favourite walk-to-a-shop route, is in Poland. I am learning Czech, but I am not learning Polish. Half the songs sung in church on a Sunday morning are in Polish and I don't even understand how the alphabet works! This hadn't been a problem up until this point. Anyway, I needed to buy some things and bought some milk too. I went home and poured some milk in my cereal and.. the milk looked a little thick but I didn't think of anything of it. So, I laughed about it and posted it on facebook so many others could laugh too and share their own variants of buying buttermilk stories. 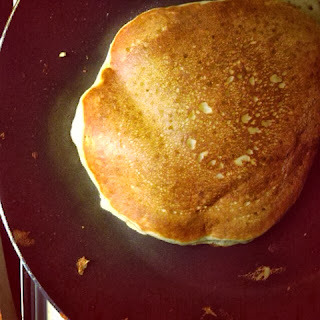 You've heard the expression "When life hands you lemons, make lemonade" - while, taking my inspiration from that I made some pancakes out of my buttermilk, some very good pancakes! Learning a new language and living in new countries are definitely humbling experiences but I'm grateful for a sense of humour and good pancakes and both of those definitely help!